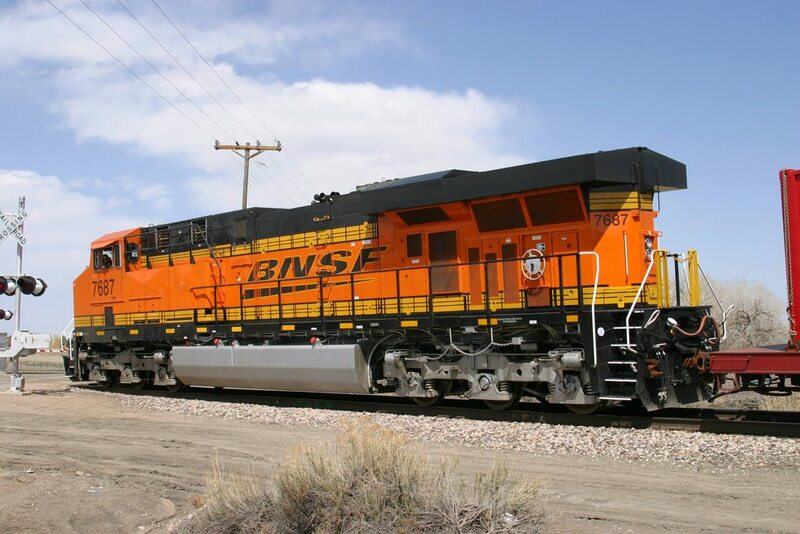 BNSF GE Evo ES44DC Locomotive in 7 wide. Hello Eurobricks. My latest build. Wheels will be replaced with steel ones as soon as I can find someone to machine them for me. Unit is powered the same way as my other two most recent builds. AA battery pack that feeds a DC-DC converter to keep the custom Bluetooth controller happy with 10.8V. BT controller feeds 2 large PF motors, 1 for each truck. Once my wheels arrive, they'll be pulling 24V from the track to the DC-DC converter as well. As long as the battery voltage is lower than that of the track, the batteries will not be utilized. There are a couple missing pieces because a brick link seller is taking his precious time getting my order together (>2 weeks at this point), but it is otherwise complete for the most part. These rear grills were especially tricky on this build due to the part selection in orange. I made do, however. Realized after taking this photo that the last step is missing. The other 3 sets are all complete, oops. Pretty happy with how they turned out. The fleet so far. There are also 2 Norfolk Southern SD70M-2's not pictured. Thinking of rebuilding them. And a short video of the 3 synced together. Each is independently controlled. Looking good and the detailing on the trucks are insane. Fantastic work! Very nice look on the tracks as well. 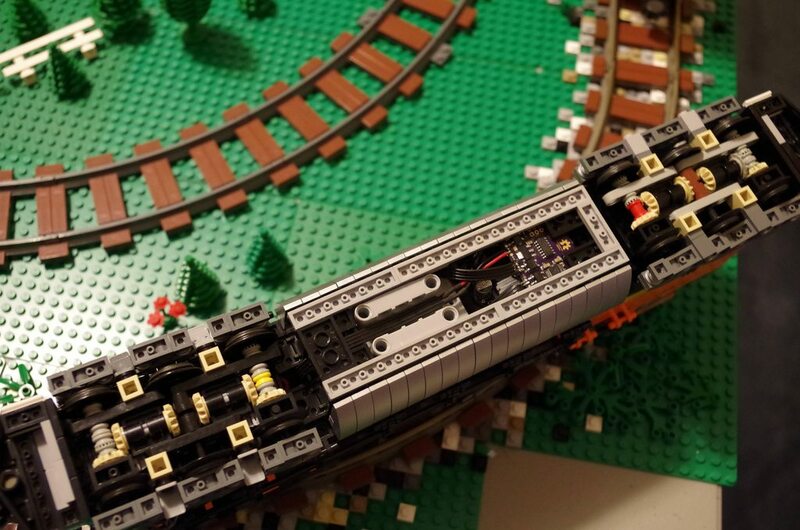 For the love of God Lego, give us something for 3 axle trucks and locomotive windshields along with side windows!!!!!!!!!!!!!!!!!!!!!!!!!!!! That thing looks awesome, nice build and definitely like your approach on the trucks. You are right on all points, of course and these are some of the things I struggled with. However, those horizontal tiles hide the AA battery pack that's mounted vertically. I'll post a pic of the bottom and from above with the top off. My Canadian National Dash 9 has the AA battery box horizontal, so I was able to use vertical 1x8 black tile to hide it. 1x8 tiles don't exist in orange (also, couldn't do the yellow stripe). As for the color scheme, I couldn't decide. I already had these old decals and didn't feel like buying new ones. However, apparently there are some ES44AC's out there with the scheme I used. See: http://www.rrpicture...e.aspx?id=32646 The physical differences between the AC and DC are so subtle they'd be almost impossible to render with Lego. I researched for several hours and submerged myself in train nerd forums to find out. So technically, I could call it a ES44AC even though I used photos of the ES44DC to build it. As for the windshield, I'd be more happy with a way to match the slopes on the hood. I have some ideas to slope the windshield on my next build. 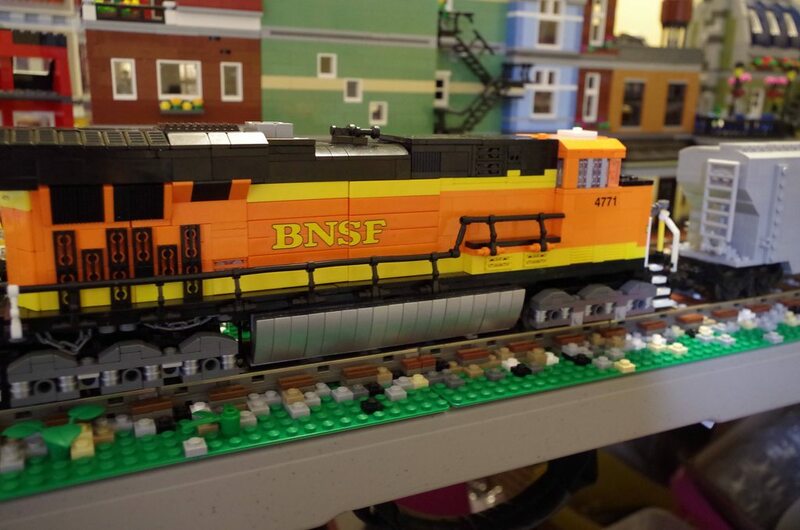 Brick built trucks are pretty easy to build and allow for much more intricate designs than plain PF train motors. (Also, PF train motors are awful for constant speeds. Large PF motors are awesome). The hard part is putting a stud spacing inbetween each axle; makes it necessary to make the middle axle slide. Thanks all! 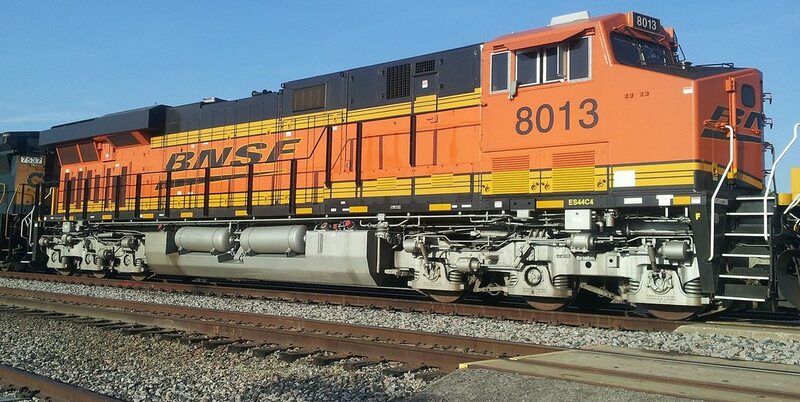 Thinking of an AC4400 with the new CSX paint scheme in dark blue as my next project. Your choice to work 7 studs wide gave me courage for my current project! Ahhh, I see what u mean about the tiles. Since its 5 wide on the body, your kind of stuck on running them horizontal versus vertical. 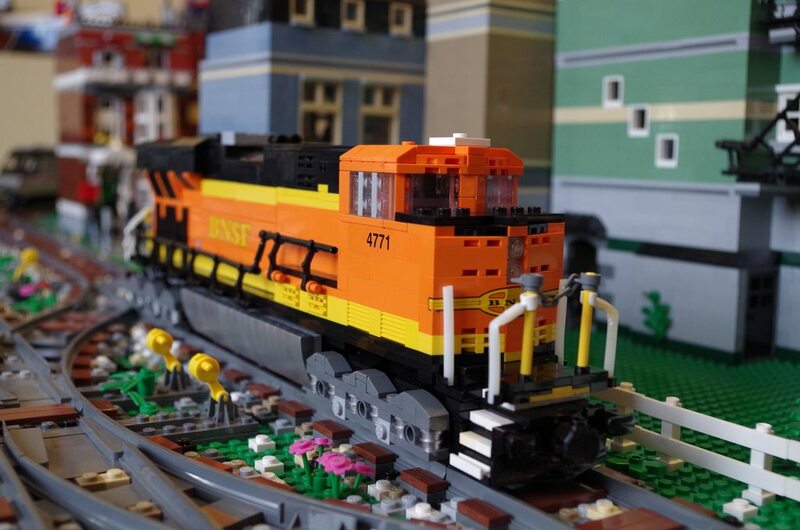 Another really nicely modeled loco. The work on those trucks is excellent - is it the same way the trucks were made for the loco in this thread? http://www.eurobricks.com/forum/index.php?showtopic=106163#entry2148590 The sideways give on the middle axle must really help around corners. For a 7-8 wide build, the extra stud between each wheel looks right. It would make the trucks visually too long for a 6-7 wide build, however. Seems there is no perfect way to make 3 axle trucks that work with the PF motor. 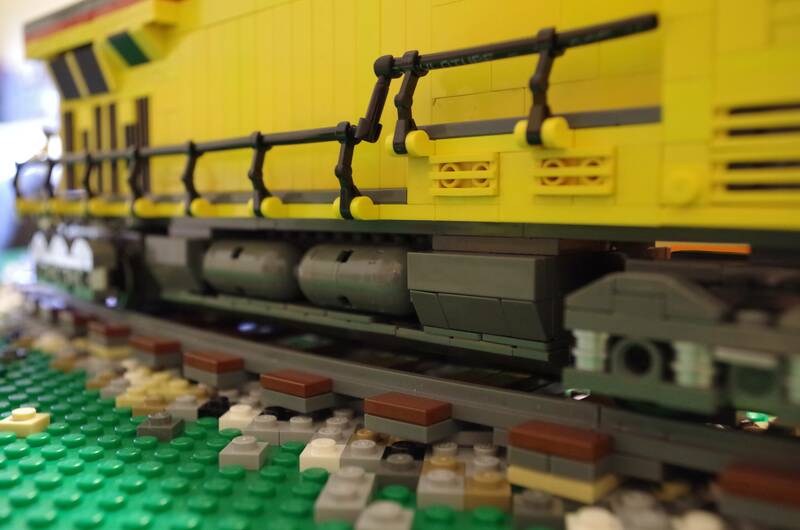 have you got any close ups of the trucks on the CSX loco? I can't see any threads on that. Just so, same design. Same locomotive plus PF actually, just a different color scheme. 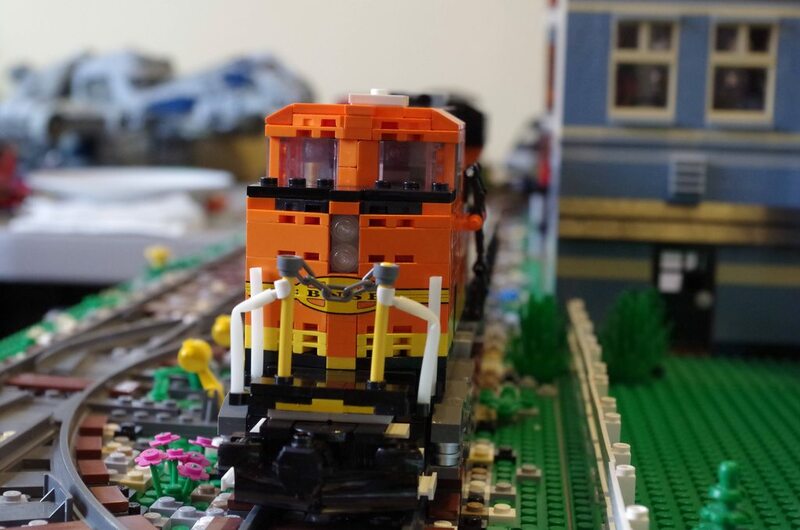 The only way I was able to make a 3 axle truck with the pf train motor was to cheat and trim some technic pins to fit into the extra holes that are on the side of the motor body. They extra set of wheels adds a lot of friction in turns though. 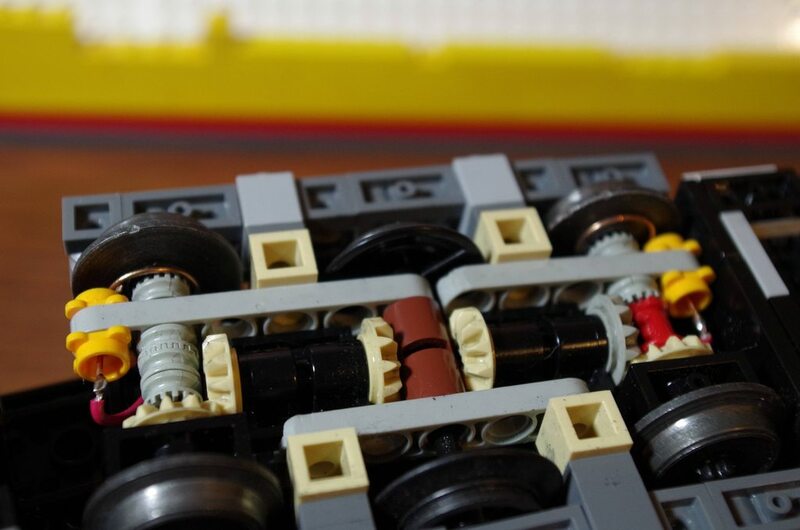 You're right about that middle axle on my models, not only does it slide side to side, but if you use flex tubing as an axle instead of a technic axle, it's able to go up and down over uneven track too, which helps keep the weight on the other 2 axles. My CSX is here: http://www.eurobricks.com/forum/index.php?showtopic=98313 same trucks, different trim. Thanks for looking! Wow! Everything is awesome (couldn't help myself )! I really like how you creatively did the back top vent things. 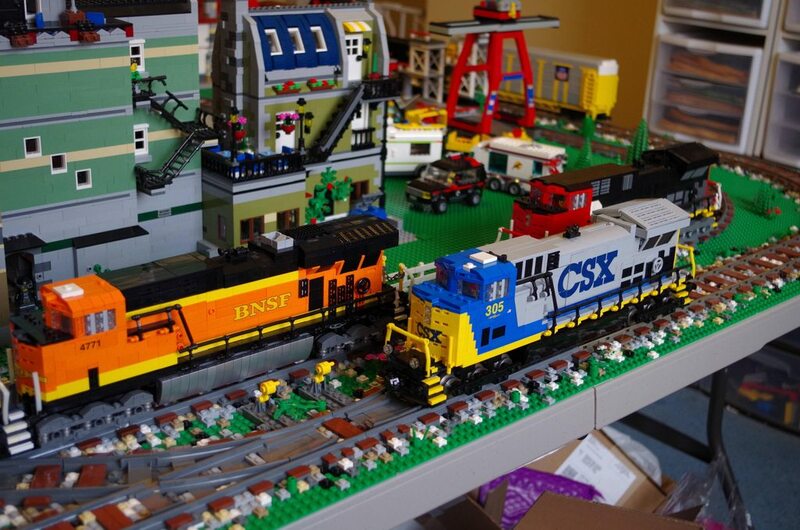 The only thing I'm not wild about bottom middle thing ( I haven't learned the names of train parts) . It's to smooth for my taste. 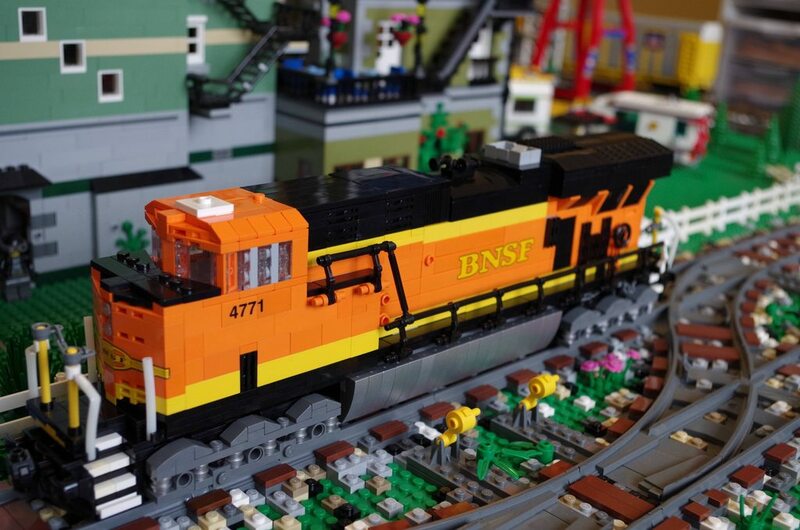 The reason the BNSF's fuel tank is so smooth is because of the electronics hidden behind it. 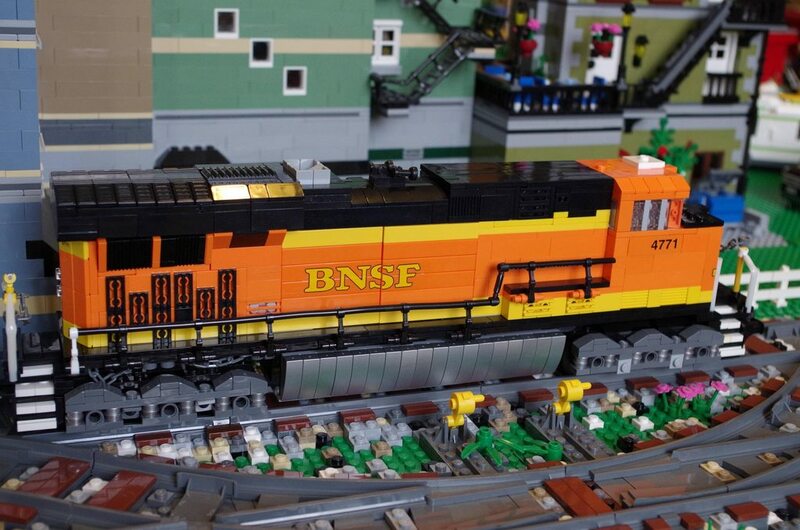 The Union Pacific doesn't have anything behind it, so I was able to snot all the correct angles. So I am coming to the realisation that for 3 axle diesel trucks to look (and potentially function) better, that the PF train motor needs to be discarded. I have a couple of questions about trying to incorporate a motor into a build (I want to try and do it in a 6 x 38 (approx.)). Will it still function well if only one truck (probably the rear) is geared and powered. Do both of these run fine plugged into the train battery box? Will they work fine position horizontally? Which takes up less space, fits into a smaller space? 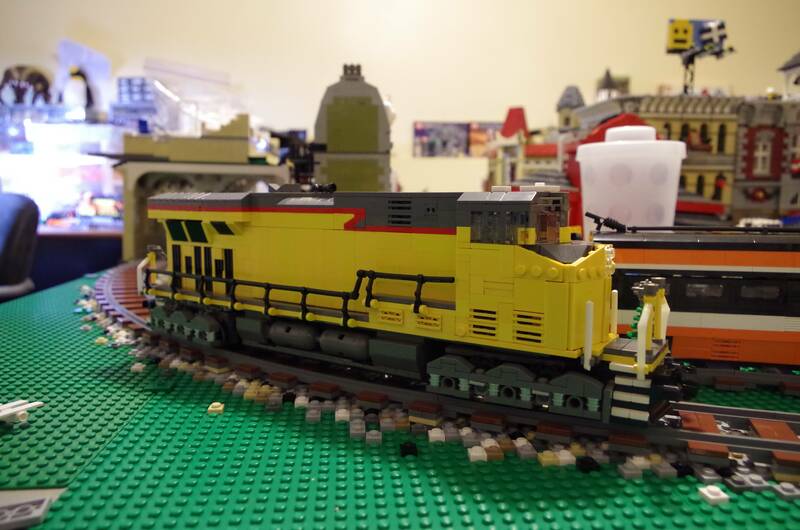 You could still use the PF train motor for a faux 3 axle truck. If you trim it out as if there are 3 axles, but in reality there are only 2, the trim will hide the fact that there are only 2. However, if you really do want 3 axles, then PF L motor is the way to go. The M motor isn't really powerful enough if you only have 1. Either one will be very difficult to hide in a 6 wide American diesel, since the rear of the train would only be 4 wide and the motor is 3W. You could use tiles to cover it though. As for only powering 1 truck, sure, it should work. 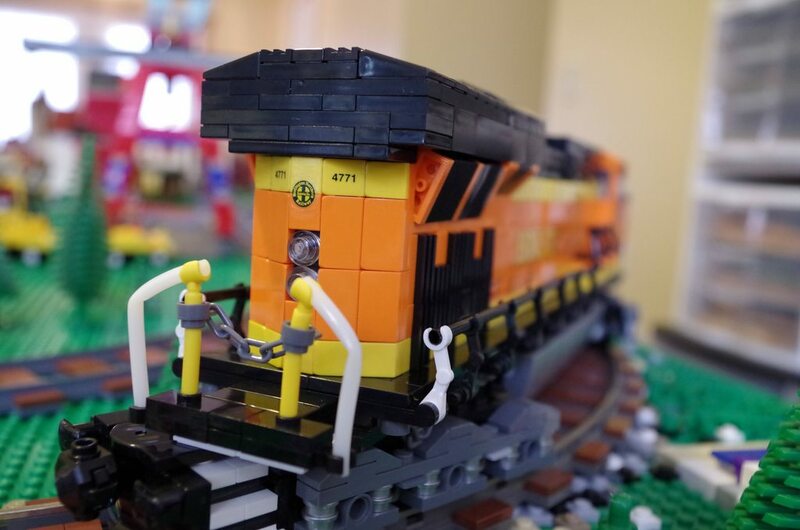 All of Lego's official train sets only have 1 powered truck. You'll have to do some experimentation of your own. Petty the M motor isn't powerful enough, it looks easier to position and hide. Thats when you use 2 of them! But make sure they are both on the same level. 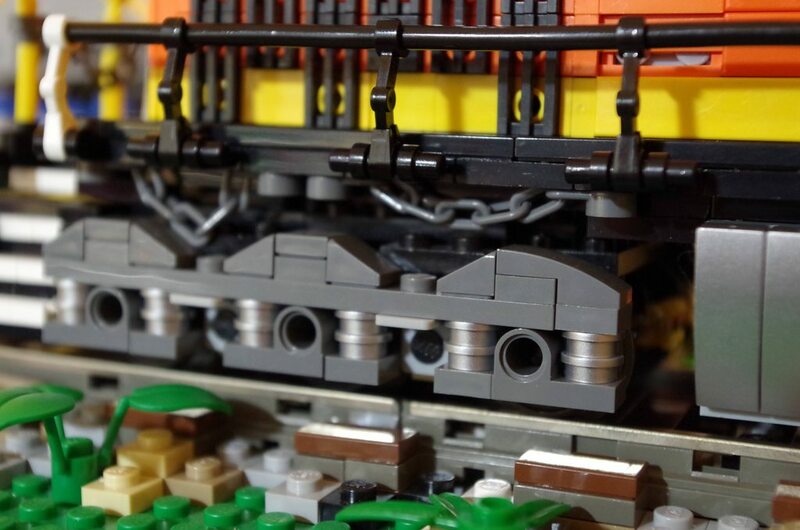 In my lateset build, I have discovered that one M-Motor just does not turn as fast as the other one which is leading a bunch of issues when I crank up my MOC for testing. This might be the issue that plagued our last train on the layout that gabe us lots of issues that we never really figured out. Incredibly detailed, very good work! Excellent. You captured the look of the real thing perfectly. 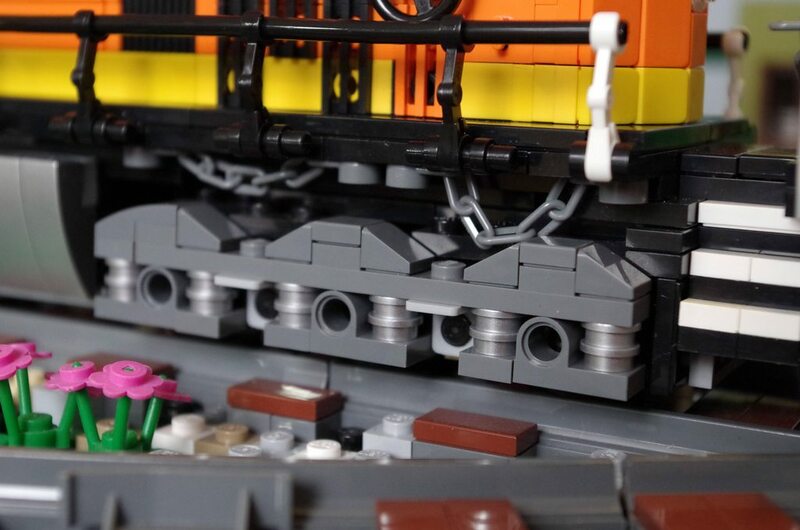 The trucks are a modified version of the one for which there are instructions in Railbricks issue 6. The only original part of it that I am responsible for is the trim. Thanks for looking! Should post a small update tonight. I replaced the wheels on it with some nice steel ones. And remove the trim to reveal some new wheels! The wheels are steel O gauge NWSL wheels with the original bore drilled out to 8mm instead of 1/8". The plastic bushings are 3D printed pucks with a 8mm diameter and a technic axle hole in the middle. The pickups are phosphor bronze (piano wire, essentially). The front truck picks up from the left side, and the rear truck picks up from the right. Track voltage is 24VDC. A diode protects the battery pack and prevents the batteries from being used unless there is no track power. A DC-DC converter feeds the Bluetooth motor controller a constant 10.8V regardless of power source. 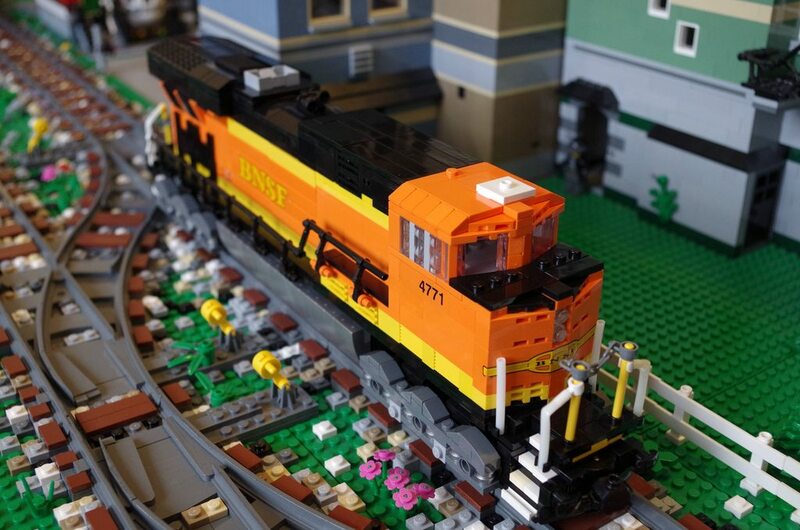 The CSX in the video below has a gigantic capacitor to store a small amount of track power over spotty track. 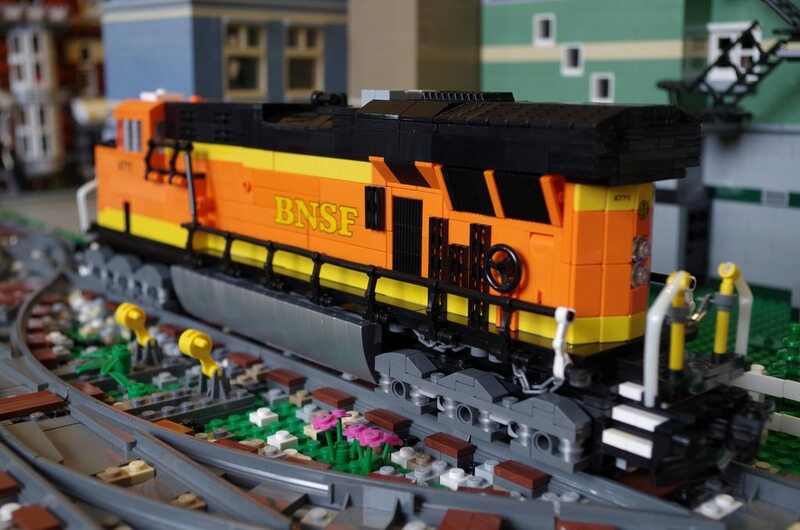 The BNSF doesn't have the cap installed yet, but it is planned. The idea is to prevent the batteries from being used as much as possible. 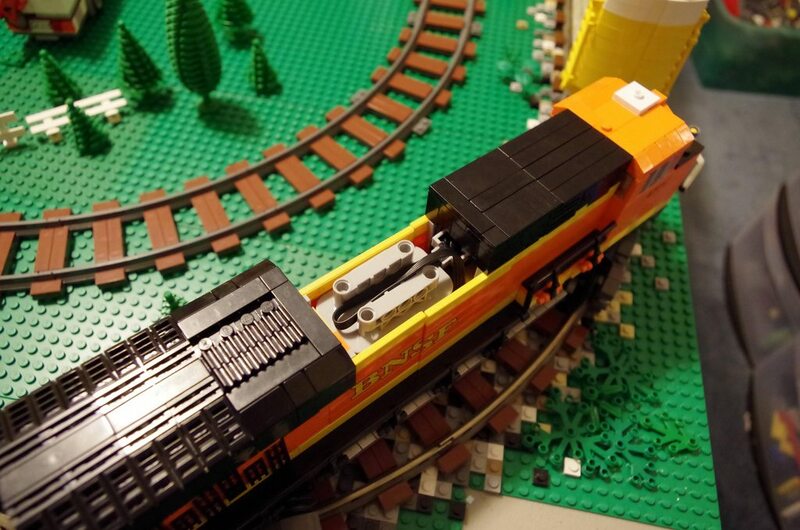 Each single locomotive can pull all 12 pieces of heavy 7 and 8 wide rolling stock by itself :) Together they can go a little faster. I've been experimenting with different wheels and ways to power the loco and I feel like this is the best. The wheels are $1.45 each, the bushings are $1.18 each, the copper wire is cheap. the BT chip costs about $20 to make, the DC-DC converter is ~$3. Not too expensive. 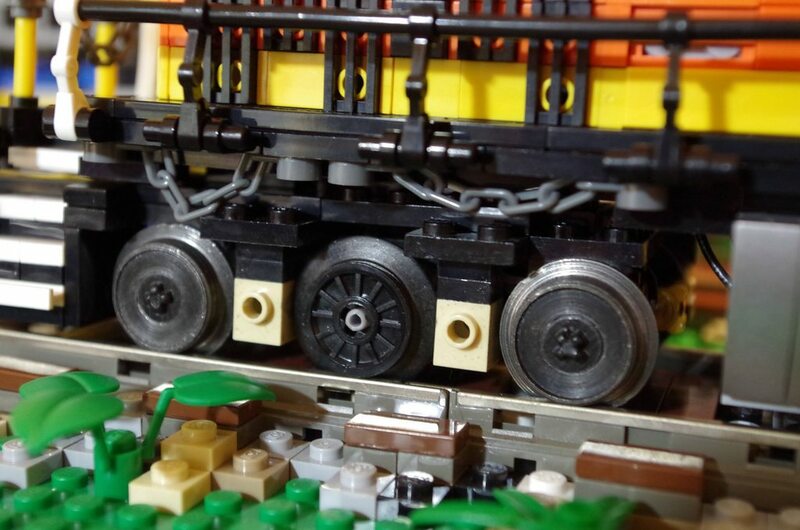 Only issue is that the flange on the wheels will need to be modified to give it more of an angle to work with regular Lego curves and turnouts. Spin the wheel in a drill and grind it down with a file. Without the modification the flange will catch on the track joints when going counter clockwise.